I may be in the minority, but I generally disagree with the unspoken rule that politicians’ family members are off-limits to the press. If politicians use warm and fuzzy images of family members to score points with voters, they can’t cry foul when the media subjects them to scrutiny – as is the case with today’s nj.com story about the legal troubles of New Jersey Gov. Phil Murphy’s son Joshua. By virtue of his father’s office and his public role in the gubernatorial campaign, Joshua Murphy is a public figure, and his troubles with the law are legitimate news. This entry was posted in Uncategorized and tagged Joshua Murphy, nj.com, Phil Murphy on June 18, 2018 by Rich Lee. 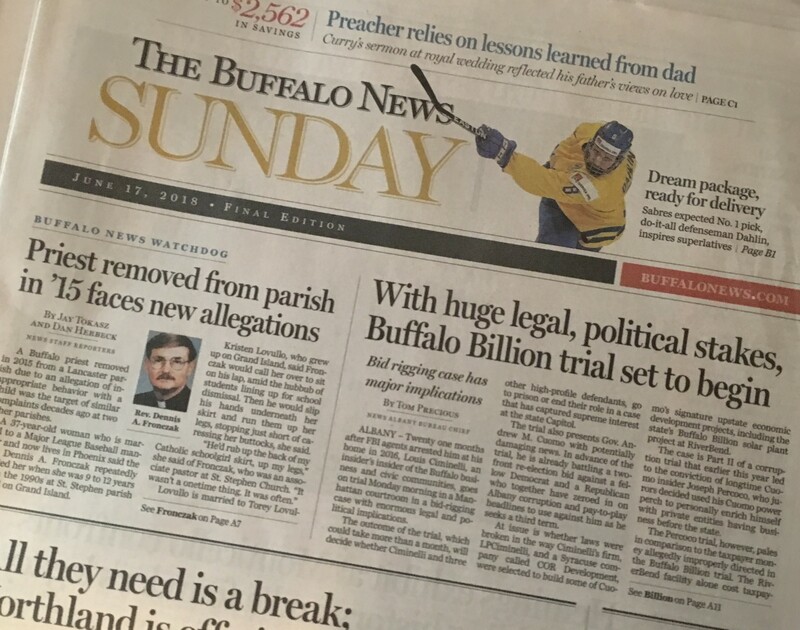 Given the fiscal state of the news industry, the changes underway at The Buffalo News are not unique. To offset revenue losses, newspapers across the nation have bid farewell to longtime reporters, eliminated once-popular sections and removed jobs that involved covering important beats, such as education, the environment and transportation. This entry was posted in Uncategorized and tagged Buffalo News, media cutbacks, Western New York on June 18, 2018 by Rich Lee.